Some German nuclear power plants are approaching the end of their designed life spans. Considering the possibility of radiation damage to the RPV material in close proximity to the core, reliable nondestructive testing techniques for the detection, classification, and sizing of surface and sub-surface cracks, as well as sub-clad cracking with extensions into the base material, are of immense interest. It has been shown that weld microstructure is particularly sensitive to neutron degradation (primarily due to high copper content), and thus very stringent NDE safety assessments are imperative. In addition to inspecting clad integrity, clad thickness measurements also become essential. This paper discusses the development of optimized, high dynamic-range, eddy current techniques utilizing a specialized yoke-type absolute coil transmitter and differential coil receiver. The eddy current working frequencies are below 500 Hz, and the combination of eddy current data with data acquired using a multi-frequency approach allows for signal-to-noise ratio enhancements and filtering of disturbing signals. Results are presented from the qualification process, which documented the reliability of the system as confirmed with specific test and calibration blocks, and during inservice inspections. And finally, because of the presented eddy current techniques in combination with optimized ultrasonic testing techniques, two older German reactors were able to achieve a high level of safety and confidence, and were once again put on-line. According to German nuclear power safety guidelines, the internal austenitic steel clad of reactor pressure vessels is assumed to be a protective layer to prevent corrosion of the carbon steel pressure vessel. Therefore, material properties and thickness of the clad have never been considered as contributors to strength and/or toughness in design and fracture mechanical regards. Inservice NDT inspection requirements only call for the inspection of the bond between clad and base material using straight beam longitudinal wave techniques. The volume of the clad is not inspected; however, ultrasonic testing is used for detecting sub-clad flaws. Typically, this is done using dual element transmit/receive search units to inspect the sub-clad material with refracted longitudinal waves (usually 70°) at a focal point distance of 30 mm (1.2 inch). The development and validation of new NDT techniques occurred with two goals in mind: 1) To supplement standard techniques with diverse information to assist in interpretation of potential nonconformance; and 2) To provide information to evaluate aspects of component lifetime extension. Currently in Germany, lifetime extension issues are not of actual concern. Recently, however, the continued operation and subsequent licensing of Germany's oldest pressurized water reactor (400 MW, two loops) was under discussion. The primary concern was an assumed increase of neutron degradation of circumferential welds (in the belt-line region) and field welds with increased copper content filler material. Due to this condition and in accordance with the specific license directives, the clad areas of and adjacent to the welds have to be inspected during each outage using a multi-frequency eddy current technique. This technique employs frequencies above 20 kHz and is limited to detection of surface-connected flaws. An optimized mixing algorithm  was applied to suppress disturbing signals caused by sensor lift-off at the rough and uneven cladding surface and by local -ferrite variations. Considering the clad contribution to overall strength and ductility when applying fracture mechanics, it was demonstrated that imbrittlement can be excluded. To secure this approach, the NDT techniques selected to document the integrity of the cladding, including detection and characterization of flaws in the volume of the clad and at the interface with the base material, had to be validated and qualified. The proposed research emphasized expansion of contemporary eddy current technology into detection and characterization of flaws in the clad volume, or beyond the penetration depth of traditional eddy currents. The clad to base material interface and the sub-clad base material areas were to be inspected using enhanced ultrasonic techniques. Due to the acoustic properties of manual or automated deposit clad, the limited ability of ultrasound to detect small flaws (reflectors) is a well-known problem; classification of reflectors as planar flaws is generally restricted in these particular areas. To solve this well-known problem, the utilization of low-frequency  and multi-frequency eddy current techniques was proposed, because these techniques offer an improvement in detection ability for small planar flaws. Contrary to the limitations of ultrasound, the proposed eddy current technique has many benefits. With eddy current, the classification, characterization, and sizing of reflector indications in the clad volume and sub-clad area are generally possible. Critical flaws, such as planar flaws, originating at the clad to base material interface and extending into the base material (sub-clad cracking) can be distinguished from those located in the clad volume that were caused during the manufacturing process. Wide signal dynamic range (> 85 dB) and strong long-range stability, for detection of even the smallest measurement effects within a high-interference environment. Effective computing ability using integrated digital signal processors (DSP). Figure 1 shows the inspection system. 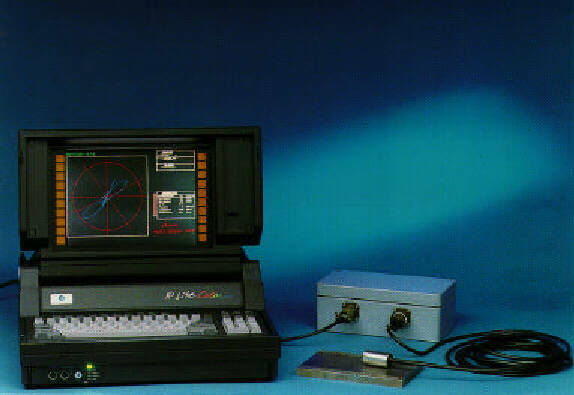 The analog eddy current electronic is contained in the interface box to the right of the PC, which is used for data acquisition, presentation, and documentation. The analog boards and the DSP-board are the main components contained in the interface box, as depicted in Figure 2 below. The DSP-board can combine up to four analog boards to accommodate different operation modes, such as a time-parallel mode with four frequencies, time-multiplexing mode, or multi-frequency mode. The transfer of inspection data to the DSP-board and to the PC is performed via a serial interface. The interrelation of the hardware and software is presented in Figure 3. The basic concept is to control most of the system functions numerically by the digital signal processing software in the DSP to minimize hardware components and expense. The signal processing firmware is based on a multi-regression analysis. The available algorithms can be interpreted as a numerical filter for different inspection tasks. Collecting all Elements Required for "Calibration Data-Matrix"
The objective of the signal processing is to suppress disturbing signals, which allows for the quantitative evaluation of target functions (i.e., the characterization of flaw type and size). The calibration of the inspection system requires well-defined calibration and/or test blocks, which represent the complete set of relevant component parameters, including all known component condition variations found during the actual inspection. Different frequency ranges combined with either absolute or differential sensors allow inspection for a variety of flaw types or clad conditions, as presented below in Figure 5. When inspecting RPV clad, a number of deviant parameters have to be considered that make processing of specific data quite difficult. On the other hand, comprehensive information of the clad condition can be individually filtered for each of the inspection tasks listed in Figure 5, using an appropriate firmware/software package. The following Figures below present actual inspection results obtained using three frequencies simultaneously. The display of post-evaluation results using a numerical filter optimized for the measurement of lift-off between the sensor and the clad surface is depicted in Figure 6. The color-coded C-scan image on the left side closely represents the surface profile of the scanned surface. The grooves of the strip-welded clad are clearly displayed along with a localized repair (ground-out). The numerical amount (in millimeters) of the sensor lift-off is indicated in the lower A-scan presentation at the current index-line (horizontal line). The spatial distribution of the -ferrite content of the scan area is displayed in Figure 7 on the following page. The numerical filter for the -ferrite prediction is applied to the acquired raw data. Both A-scans indicate the percentage of the -ferrite content at the cross-line cursor position. To detect and analyze the scan area for surface-connected planar flaws, a filter is applied that suppresses non-relevant signals caused by the lift-off effect and/or signals due to -ferrite influences. The C-scan, presented in Figure 8, shows the indications of surface-connected EDM notches contained in a calibration block. These notches--- oriented parallel, transverse, and oblique to the weld---are easily detected and displayed in the C-scan presentation. The depth of each individual notch is indicated in the amplitude display (A-scan display) as a function of amplitude height. Additional filters can be applied to select the display of planar reflectors of specified depth. To obtain the required quality of the above presented results (lift-off filter, -ferrite filter, and surface-connected planar flaw filter), high-frequency techniques, operating with 50 kHz, 280 kHz, and 600 kHz are used for inspection. For investigation of the clad volume, low-frequency techniques using 510 Hz, 2.8 kHz, and 5 kHz are employed. Figure 9 presents clad thickness results furnished with the numerical filter for clad thickness testing. Local thickness variations are clearly indicated in the C-scan presentation, where clad thickness ranges from 6 mm up to 12 mm, whereas the nominal clad thickness should be 8 mm. For the detection and characterization of volumetric flaws buried in the clad volume, specific differential coil sensors operating in the low frequency range are applied. Figure 10 displays evaluation results using a numerical filter for the detection of volumetric flaws in the clad volume. The C-scan presentation reveals three side-drilled holes. On top, the cursor location on the A-scan presentation shows the indication amplitudes representing remaining ligaments of 2, 3, 4, and 6 millimeters as a function of amplitude height. Again, additional filters can be applied to select for display of only reflectors of a specified depth. Planar flaw indications in the clad volume and flaws in the sub-clad volume are not detected with this filter type; these require application of a filter described in the following paragraph. Figure 11 presents results of the inspection for planar flaws in the clad volume, applying yet another specific numerical filter. All unwanted signals, such as those described previously, are suppressed so as to display planar flaws embedded in the clad only. The cursor location on the A-scan presentation at the top shows the amplitudes of the indications representing remaining ligaments of 4 and 6 mm as a function of amplitude height. The filter applied for this flaw type can be expanded to select the display of planar reflectors of specified depth also. Finally, a numerical filter to detect and characterize planar flaws in the sub-clad volume (under-clad cracking) is applied, as presented in Figure 12. The indication is detected at a remaining ligament of 8 millimeters, representing the clad to base material interface at nominal clad thickness. Due to the local increase of electrical conductivity at the clad to base material interface, this inspection technique benefits from the enhancement of the eddy current density, producing a high signal-to-noise ratio for the detection of planar flaws extending to the clad to base material interface. The system, as described above, was applied in 1995 during Spring and Fall outages in two aging German nuclear power plants. Much practical knowledge was gained from this experience, including that the available set of calibration and test blocks represented only a limited, insufficient amount of possible component variables, specifically for the real-world RPV clad. Local variations of the clad condition could be detected, especially at repair locations; however, it was learned that relatively large values for sensor lift-off and sensor-tilt have to be considered, particularly for older plants with excessive grooves between the weld strips. Our experience showed that calibration of the numerical filter functions using plant-specific calibration blocks (that should closely represent the plant-specific component variables and clad deposit process) produced relevant indications along with indications (false calls) which could not be replicated on the given calibration block(s). Prompted by these "false call" indications, we improved our software to extend the calibration from the standard calibration block(s) reflectors to additional calibration reflectors obtained from the actual RPV clad. The resulting evaluation software can be applied off-line after the data acquisition process. The filter coefficients obtained from the standard calibration block(s) are applied to the actual component input data. Obviously, only indications corresponding to the flaw type and component condition of the calibration block(s) used during the filter calibration can be analyzed. All other signals have to be analyzed without correlation to known calibration block reflectors. Based on this situation, data analysis is unreliable if sufficient correlation of relevant conditions and properties of the calibration block(s) and inspected component is unknown. The existing database is expanded with a few additional data points. These additional data points (e.g., 50 additional positions) are randomly inserted in the original inspection area of approximately 100,000 data points, thus decreasing the general noise level. However, the ability of the algorithm for flaw detection, classification, and sizing has to be controlled and verified on the standard calibration block, and new recording thresholds have to be established. If, accidentally, one of the additional data points is caused by a relevant flaw, the statistical impact to the overall calibration is negligible. The existing database is expanded with one or more of the "false calls", regardless of relevancy, and tagged as non-relevant noise. This new filter data is compared to the calibration data reflector of the standard calibration block and the acquired component data. If the "false call" indication was caused by non-relevant noise or disturbance, the signal-to-noise ratio of the component data will be largely improved while the calibration data remain nearly unchanged. If the "false call" signal from the component data was produced by a relevant flaw response, then the new filter coefficient produces significant and notable variations to the calibrated reference reflectors in the original calibration data. A flaw, comparable in type and size with the calibrated data, can then be assumed. This strategy, which significantly reduced the total number of reportable indications without decreasing inspection quality, has been sanctioned by the German authorities and it was successfully applied in the two older German nuclear power plants. The documented results demonstrate the potential of the newly designed eddy current inspection system to assess the integrity of reactor pressure vessel clad. Using the data interpretation capabilities provided by the system's hard- and software, comprehensive information in addition to more conventional NDE information is obtained. By virtue of the inspection features, to characterize surface-connected flaws, volumetric and planar flaws buried in the clad volume, and sub-clad flaws connected to the clad to base material interface, combined with information pertaining to the surface topography, cladding thickness, and -ferrite content and distribution, this new technology, when used in combination with ultrasonic and visual inspections, will provide significant weight when discussing lifetime extension strategies for nuclear power plants. The application of this technology (applied to the entire clad surface from the ID of the reactor pressure vessels) in two aging German nuclear power plants provided major contributions to the authority's decision-making process, which ultimately allowed the continued operation of one plant and the restarting of the other. The assumed imbrittlement of the reactor pressure vessels were safely excluded as they were shown not to present any risks to the plant or to public safety and health. Libby, H.L. ; Introduction to Electromagnetic Nondestructive Test Methods, 1st Ed., Wiley Interscience, New York, USA, 1971, chapter 7 and 8. Becker R., Disqué M.; Low frequency eddy current inspection of the pressure vessel clad, new approach and future works in modeling, Proceedings of the EPRI Pipe Inspection Workshop, Session V, Charlotte, USA, 1993. Becker, R., Both N., Kröning, M.; A New DSP-Controlled Eddy Current System In Modular And Compact Design, Some Applications Of Reactor Component Flaw Inspection, Proceedings of the EPRI Vessel & Internals Inspection Conference, Session IIb, Charlotte, USA, 1994. Becker, R., Dobmann, G., Kröning, M., Reiter, H., Schneider, E.; Integration of NDT into life-time management, Proceedings of the International Conference on Pipes and Pressure Vessels, Feb 1 - 2, 1996, Singapore, Malaysia. To be published in The International Journal of Pressure Vessels and Piping.